NEW YORK -- For Mike McDade, July 13 will be just another day at the office. 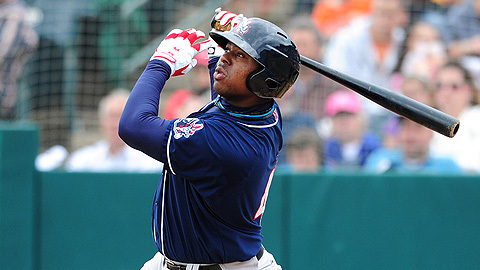 McDade, the New Hampshire slugger and the Eastern League's top run producer, was among those players selected on Wednesday to the 2011 Eastern League All-Star Game. The Blue Jays affiliate will host this year's event. Fans are well acquainted with McDade, who has knocked in 22 of his 52 RBIs at home this year. He also leads the league with 25 doubles and 49 runs scored. McDade will be joined by teammates Adeiny Hechavarria, Moises Sierra, Travis d'Arnaud, Henderson Alvarez and Joel Carreno on the Eastern Division roster. McDade and Carreno were both voted in by fans. The Eastern team also will feature Red Sox prospects Will Middlebrooks, Chih-Hsien Chiang, Stephen Fife, Alex Wilson and Alex Hassan of Portland. Hassan leads the circuit with 49 walks, while Fife's eight wins have him tied for first. The Yankees are well represented with catcher Futures Game All-Star Austin Romine joining Manny Banuelos, Dellin Betances and fan favorite Corban Joseph. Harrisburg will send five representatives to the game for the Western Division squad, including Archie Gilbert and the league's active home run hitter, Tyler Moore. Bill Rhinehart, who ranks second with 12 homers, will join Erik Arnesen and Futures Gamer Brad Peacock. Peacock, tied with Fife with eight wins, and Moore were voted in by the fans. Akron's Chun-Hsiu Chen was voted by fans as the West's catcher, giving him a chance to backstop Aeros pitcher Austin Adams, another fan selection. Previous Eastern League All-Stars include Ryan Howard (2004, Reading), Kevin Youkilis (2003, Portland) and Kyle Drabek (2010, New Hampshire). * denotes selection from fan balloting. ^ On July 1, the Eastern League announced the following change to the Eastern Division roster. New Hampshire pitcher Henderson Alvarez is attending the game but unable to pitch. Teammate Zach Stewart will replace Alvarez. In the Western Division, Harrisburg pitcher Brad Peacock will not be attending the game. Teammate Hassan Pena will replace Peacock. On July 6, the Eastern League announced three changes to the Western Division roster. Erie pitcher Casey Crosby has been added in place of teammate Chance Ruffin, who has been promoted. Akron reliever Cory Burns has been added in place of Bowie's Pedro Viola, who has been promoted. Richmond catcher Johnny Monell has been added in place of Akron's Chun-Hsiu Chen, who is injured. On July 8, the Eastern League announced one change to the Western Division roster. Bowie pitcher Timothy Bascom has been added to the Western Division roster. Bascom replaces Richmond pitcher Eric Surkamp. Danny Wild is an editor for MLB.com. This story was not subject to the approval of the National Association of Professional Baseball Leagues or its clubs.